This message is about a concept that should revolutionize the way you think about ministry and God fulfilling His call and destiny in your lives. It’s an attitude that must be in place in our lives if we are to properly motivate one another to great exploits in Jesus. We are living in an age that will demand more and more of us as Christians. If Christianity is to become more of a force to be reckoned with, it will demand that we as Christians are more involved in great exploits for our King. We need to be men who provoke one another to great exploits in God. Daniel 11:32 (NKJV) "Those who do wickedly against the covenant he shall corrupt with flattery; but the people who know their God shall be strong, and carry out great exploits. God’s desire is for all of us to be people who know our God and thus doing great exploits for Him. The focus of this message is about encouraging others and esteeming others as more important than yourself. It’s about being an armor-bearer. It's about perceiving the grace and anointing in others so that you can properly encourage them to great exploits in God. This is a powerful story of someone who knew his God and what God was capable of and how Jonathan’s armor-bearer encouraged him to take a risk of faith that brought forth a great exploit and victory for the nation of Israel. This passage of scripture truly shows how we must work together to do great exploits for Jesus. Background of Story: Saul and his army are reduced to about 600 men because the Philistines are operating from a stronghold and terrorizing the Israelites to the degree that most of the army has deserted and is hiding in caves, thickets, rocks, holes and pits. Of the 600 men only Saul and Jonathan have weapons, because the Philistines took away all their blacksmiths. Similar to where Christianity is today: Much of Christianity today is cowering before the enemy with our entire spiritual arsenal stripped from us because we have compromised ourselves before our enemies of the faith. 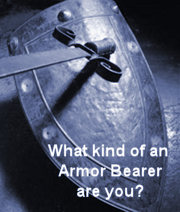 What Does It Take to Be a Good Armor-Bearer? We find some of these attitudes later on in the life of Jonathan in his friendship to David. Even though Jonathan had has his great moments in battle, he was perceiving the grace of God in David and that God had truly called David. He must decrease while David increases. In the same way that his armor-bearer laid his life down for him, he must now do the same for David. Jonathan and David were both kingdom men. They saw beyond the natural circumstances and into the kingdom perspective. 1. We Must See Our Lives Through A Kingdom Perspective . Are you seeing your life through the here and now and what benefits you the most or do you see your life through an eternal perspective? 2. We Must Be Willing To Lay Our Lives Down For The Benefit of Others and the Kingdom. Jonathan sacrificed his position for the throne in light of the grace he perceived in David. I believe he took an inventory of his life in comparison to David and knew in his heart David was the man – not him. 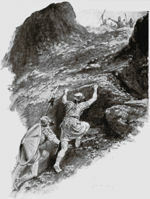 As a result he fully supported David and helped David to become the great man of God that he was. 3. We Must Develop An Attitude Of Honoring And Preferring One Another. This really is the attitude adjustment that needs to take place in all of our lives if we are to successfully encourage one another to great exploits. 4. We Must Recognize The Season We Are In And Build Our Lives Within The Balance. Jonathan recognized both seasons he was in. He knew when it was time to step out in faith to perform great exploits and he also recognized the season of being a great encourager to David. Kingdom people have a sense of where they are at and what they have been commissioned to do and build accordingly. Do you? I believe it’s time for the balance of power to change in our spiritual warfare. Just as Jonathan and his armor bearer were able to change the balance of power for the nation of Israel, I believe we can do the same for the church as we link together with those we are serving with. Especially now, as we are positioned at the gates of the city, let us go forth in the position God has ordained for this season of our lives. Let us march in step with each other, no one pushing or shoving for position, but rather united together to hear the voice of God as He gives voice to his great army in this hour of our destiny!